Minimalist lifestyle is now more and more popular, which means the number of people choose such simple yet convenient items is increasing. In fact, slim wallets are getting hotter than ever if not saying that they are trendy these days. In this article, I will show you top best mens wallets under 50. Nothing’s better than a wallet that now add the waterproof ability, isn’t it? When it comes to Ebax’s wallet, the very first thing you will be assured is its quality. Not only is it durable, quality and eco-friendly, but particularly this design also comes in waterproof feature as it is made out of synthetic and microfiber material. Besides, it’s very lightweight and slim with roughly 4*2.8*.02 Inch to stay in your pocket. The biggest advantage of such this kind of material is that it can bear a heavy load including many elements without getting damages. Last but not least is their quality warranty to ensure you always feel happy with the purchase. 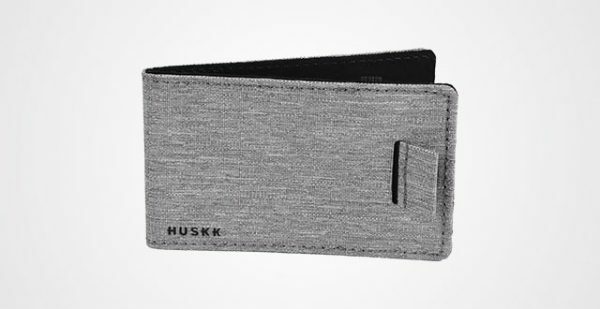 Huskk Wallet is even smaller and slimmer than the Ebax, which is perfect for those who are looking for a minimalist design to carry. Its measurements are just a little bit bigger than an ordinary bank card, roughly 4.6 x 3.3 x 0.5 inches with thin material. That’s sound weak and insecure, right? 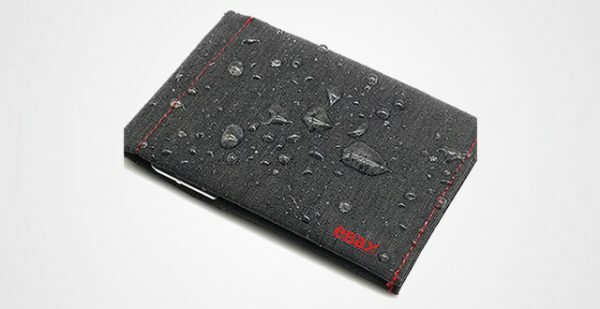 But in fact, like Ebax wallet, it is made out of high grade microfiber and synthetic material for striking durability, thinness and lightweight. In comparison of longevity, this material is nearly equal to genuine leather, guys. So, if you prefer a modern and future look, don’t hesitate to consider this design. In terms of design, there is a smart pull tab on the frontside and an elastic band to keep cards on the inside. It’s totally different from those cheap elastic bands on the market and just get no fears of it becoming loose after a short time using as the material is high quality. On top of that, if even you don’t find its quality meets your requirement, just return it for no excuse. They provide 100% money-back guarantee to assure customers to always feel happy with their products. The next one we will be talking about is Lethnic Slim Wallet. What makes these slim wallets for men becomes one of my favorites is its clever design and smart compartment arrangement. 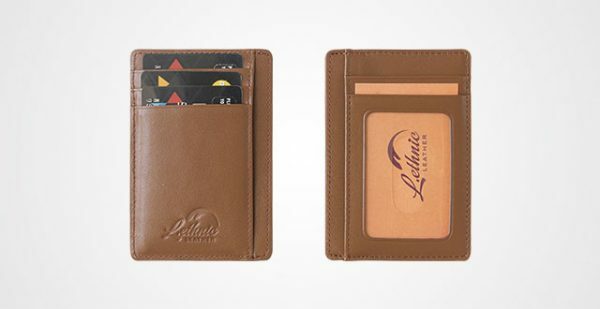 Though the wallet is just 4.33 inches long and 2.95 inches wide, there are totally 4-5 card slots, 2-3 money pockets and 1 ID window. From that point, you can store maximumly 5-7 cards, 1-2 ID cards and lots of folded money. The real fun is that even the wallet gets full, it is just around 0.4-0.6-inch-thick for maximum so you can easily place it in anywhere, like front pocket, back pocket, breast pocket, suits to jeans. Not only does it minimize your carry, but this Lethnic wallet is also stylish. The whole wallet is made complete from genuine cowhide leather. You see, a 100 percent real leather wallet, just under $50, that’s a big deal, right? It gives a specific softness and flexibility while being comfortable to touch. The inner material is also high quality to deliver smoothly sliding your cash or cards in and out. There’s more, tight lining seam, nicely logo embossing, this wallet is truly durable, simple yet unique. It can absolutely do a speak for your personality. Travelambo is a well-know brand on men’s accessory that might you already know. But, I want to say this one is the thinnest at only 0.1 inch thin. You are not going to find the thinner wallet out there on the market, at least I haven’t been able to. It’s made from high-quality top gained genuine leather to give a tough surface but soft to touch. The wallet is also lightweight so that hardly you feel of carrying it around. The dimensions are designed reasonably to fit well with any pockets, just 4×3.2 inches. However, don’t underestimate its capacity. Despite such striking thinness and slimness, there are even 6 cardholders in addition to 1 long top compartment for cash, bills or receipts. On the other hand, the manufacturer offers 1-year warranty so I think there’s no reason to give it a try. I must say that it is the best thin wallet in this collection. It’s unique and special from the material to design. Instead of using genuine leather like many other wallets, this one utilizes aluminum to deliver a strong, square and sturdy design, which helps to hold your properties safer and better. It might look slim and compact, but don’t fret, it really spacious thanks to the high-quality silicone band. In fact, this wallet can keep up to 20 cards at the same time easily, no falling, no losing, very stable and protective. Actually, there is a previous version of ROCO minimalist aluminum slim wallet, but I myself do like this later one as it is slimmer and the band is more elastic, giving more durability and convenient. However, I don’t recommend to place this wallet on the back pocket or at least, sitting on it because of the material. You might feel uncomfortable to sit on it. Instead, placing the wallet in the front pocket is better. 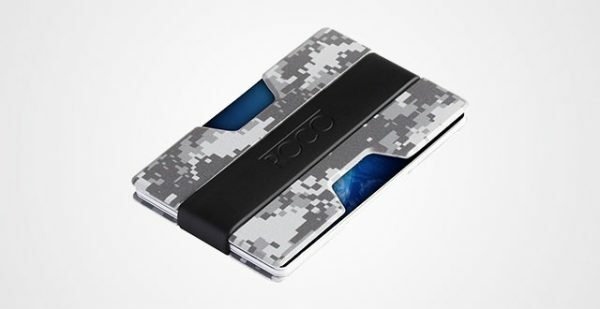 If you are a type of guy that’s into aesthetics and just wants a really cool-looking wallet or something like that, this is probably for you. 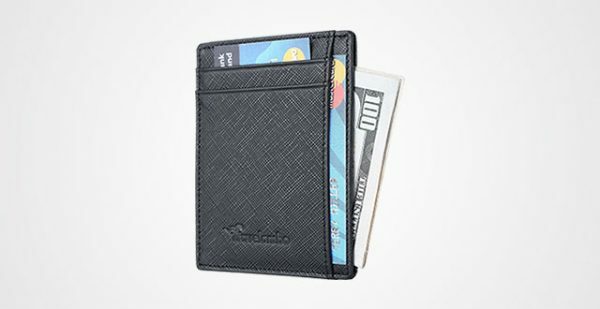 Here are best mens wallets under $50 for those who either in a tight budget or want to try this trendy kind of item. Hope that it is helpful for you to pick the right one. And always follow the Top List to keep up with the tips on leather and leather wallets we share for you.